Part of a secret report on the Shirley McKie fingerprint case is to be handed over to a Holyrood inquiry. BBC Scotland has learned that, following repeated requests, the lord advocate is considering which parts of the report can be released to MSPs. Leaked copies show that it alleges criminality within Scotland's fingerprint service. Ms McKie, from Ayrshire, was cleared of perjury after a print found at a murder scene was wrongly identified as hers. The unpublished report was compiled by former Tayside Deputy Chief Constable James Mackay. He was asked by the lord advocate to investigate how Ms McKie's print could have been wrongly identified. Until now, the lord advocate has insisted that for legal reasons the findings should remain confidential, although leaked copies have been published by some media organisations, including BBC Scotland. The frustration of MSPs sitting on the inquiry panel was heightened last month when Mr Mackay gave evidence, but refused to answer questions about his report. The panel is expected to welcome the new formal evidence, but several members have said they will continue to demand access to the complete report. Ms McKie, a former Strathclyde Police detective, was awarded £750,000 compensation over the mistaken identity of her print in 1997. Ministers had called the misidentification an "honest mistake". 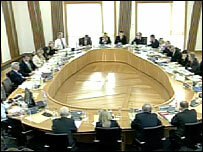 The case prompted the Justice 1 Committee to launch an inquiry into the Scottish fingerprint service.